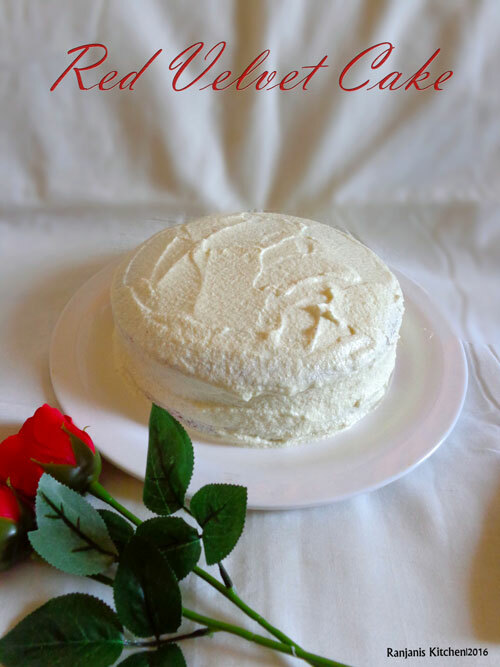 Eggless Red Velvet cake recipe – thought of making something special for valentines day. And ended with Easy red velvet cake with cream cheese frosting :). What else is more special than this for valentines day. 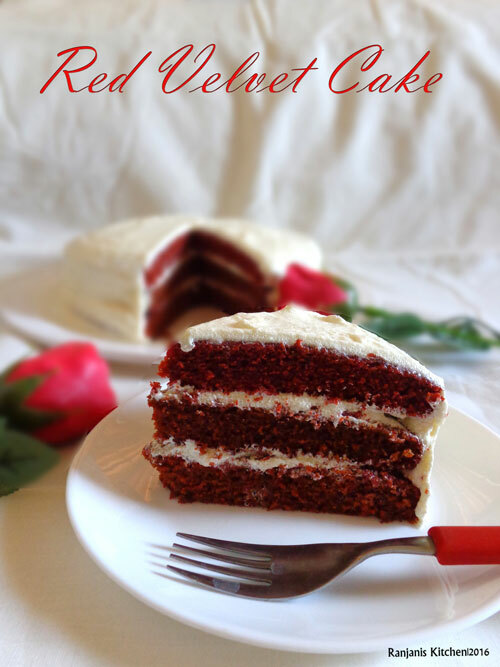 This moist red velvet cake is made with simple ingredients and iced with cream cheese. After watching the movie premam, I planned to prepare this velvety cake and this is the right time I hope 🙂 This cake didn’t fail me in first attempt itself. I made this as three layered cake and I baked each layers separately to get equal size. 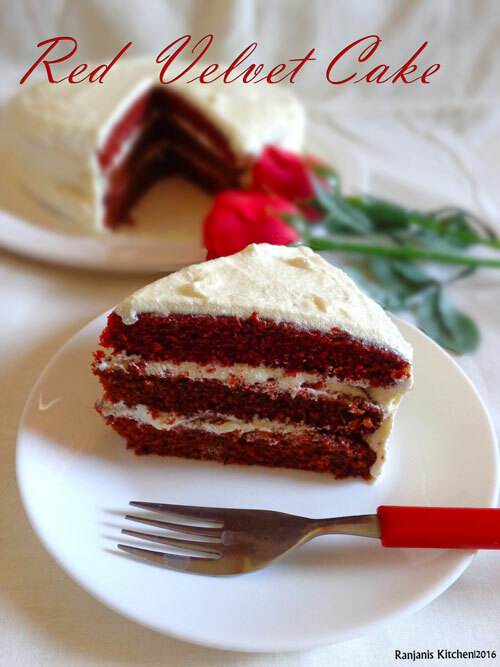 You can easily make this red velvet cake at home. 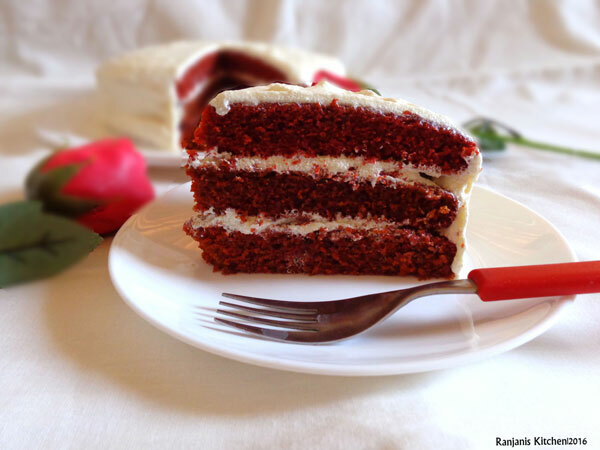 Check out how to make eggless red velvet cake with stepwise pictures. Pre-heat the oven to 180 degrees. Grease the cake pan with butter and keep aside. In a mixing bowl, take sugar ½ cup and 1/3 oil, whisk well till the sugar dissolves completely. Then add butter milk, vanilla essence and vinegar. Beat well till all the ingredients incorporate. Sieve dry ingredients all purpose flour, cocoa powder, baking powder and baking soda together into wet ingredients. Slowly beat without any lump. Add food color into it and give a gentle whisk. Transfer this to greased pan and bake in pre-heated oven for 40 mins. Check with fork or tooth prick by inserting in centre, If it comes out clean, the cake is done. After 5 mins, invert the cake in cooling rack and completely cool down before frosting. Do the same for two more cake layers. For cream cheese frosting, in a mixing bowl, take cream cheese and butter in room temperature. Beat well till it becomes soft. Now add icing sugar and beat till it becomes completely frothy. Finally add vanilla essence and beat to soft peaks consistency. Place some cream on first layer and spread using a knife, place the second layer on top of first layer. Do creaming on second layer and place the third layer over it. Do icing on sides and top of the cake. Let it sit for 10 mins. Cut into slices and serve. Pre-heat is must to bake the cake. So pre-heat the oven for atleast 10 mins. You can use edible red gel or liquid food color for coloring. If you want natural food color use beetroot juice also. 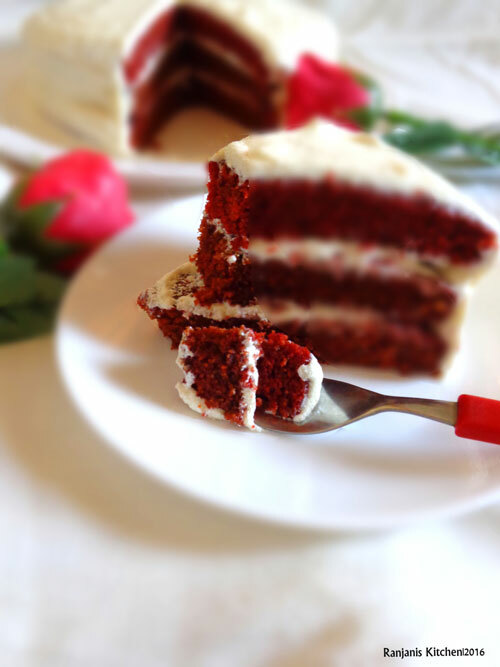 Cream cheese frosting is the best combo for red velvet cake. Instead we can do any frosting like butter cream or whipping cream. If you don’t want three layers, you can stop with two layer or single layer. The cake measure I mentioned above is for single layer. I repeated the same measurements for remaining two layers. If you have big sized OTG or oven, you can bake three layers at a time. Vanilla essence is enough for the flavour. You can get amul cream cheese in super markets. We can make it in home also. i post the recipe soon. you can use same amount of curd or milk instead of buttermilk..
U mean only milk oor curd or both mided tgther ??? Hey i baked red velvet using your recipe and believe me it turned out amazing. Everyone loved it. I would like to show you my cake. Also, i have a question – can we add blue color instead of red to make it blue velvet cake or it has some different recipe? Hello Ranjani.. this looks like a simple and promising recipe.. But i have a question.. I don’t want to use food color. Can I replace the vinegar with red wine vinegar..and skip the colour? Ok..thank you for the prompt reply.. ? Just wanted to know if we could use cheese spread instead of cream cheese and if we could use gel based colors in the cake batter as well as the frosting…. Instead of buttermilk cn v use set curd? what is the measurement in ML of 1cup flour in red velvet cake? Hi, the butter is already salted. Do we require more salt in the cornflakes cookies?